Dental implants are the best solution to missing teeth caused by severe decay, gum disease or tooth injuries. Dental implants are titanium screws placed in the jawbone that prevent bone loss and are the most durable and longest lasting solution for a restoration attachment. 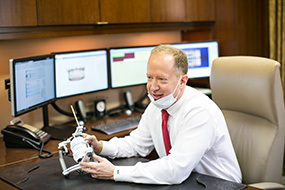 At Forsyth Dental Partners, our in-house CAMLOG implant placement is an important aspect of our restorative-driven implant planning, which is implant placement focused on final restoration. Why should you see us instead of a specialist? First, you will be working with someone you know and trust when you choose Dr. Brian Carpenter to place your implants. Second, when referred to a specialist such as an oral surgeon, your implant will often be placed in the best area of the bone, sometimes without regard for final restoration accommodation. This makes it difficult for your dentist to place the final restoration and compromises treatment. Dr. Carpenter plans all cases with the final outcome being his top priority. The restorative outcome is discussed in the early treatment planning stages, and there is no loss of communication from beginning to end. We will place your implants and allow them to integrate into the bone before continuing with restoration. We will see you about every four weeks and perform a load test until your implant is fully integrated and ready for restoration. We often are able to remove teeth and place implants in same visit. This speeds up your restoration timeline by approximately four months. In some instances, Dr. Carpenter can provide immediate load implants. These are implants that can be placed into your jawbone and restored with a porcelain crown during the same visit. Our implant-supported dentures eliminate the embarrassment of denture slippage and provide security that allows you to enjoy foods that are traditionally off-limits to denture wearers, such as apples and steak. In cases where all teeth are missing, an overdenture can be supported by four to eight implants. Our LOCATOR implant attachments provide customizable levels of retention and pivot, which make it easy for our patients to seat their own overdentures. 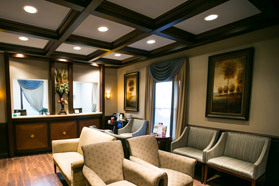 We offer local anesthesia using The Wand® STA, oral anti-anxiety medication and nitrous oxide sedation (laughing gas) to eliminate anxiety and discomfort. Fixed Implant supported dentures- we do them. If you’re missing all teeth. Denture on 4-8 implants. Implant supported overdenture. Locator attachments- snap in overdentures. Anesthesia- local, oral medications, laughing gas. No conscious sedation. We also offer Immediate placement of implants after a tooth is extracted. We remove the tooth and place implant in same visit. Speeds up timeline about 4 months.